Musicrazor is an app that analyzes the music library on your iPhone or iPod Touch, then displays statistics, rankings, and graphs about your music collection. Basic Stats - e.g. song count, total play count, etc. Assorted Stats - e.g. % of library never played, # of 1-song artists. 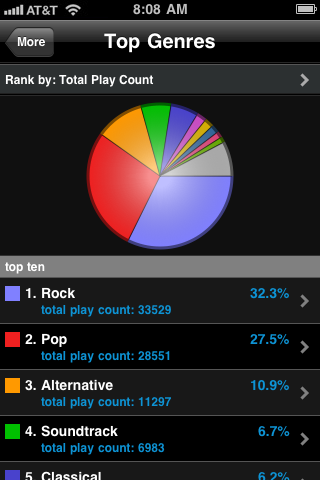 Top Genres - Ranked by play count, song count, or avg play count. Features a Top 10 pie chart. Top Artists - Ranked by play count or song count. Filterable by genre. Top Albums - Ranked by play count or song count. Filterable by genre. Top Songs - Ranked by play count or weighted score. Filterable by genre. View song details and play the song. Ratings Distribution - # of songs for each rating. Last Played Distribution - # songs played this week, the past month, etc. Sound interesting? Check out some screenshots of the app.